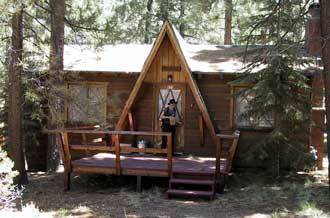 We spent four days in the mountains, in this cozy little cabin in the Moonridge area of Big Bear. It's about three hours from La Jolla, so we could get there after the wedding without being totally wasted when we arrived. An album in the cabin contained letters from previous guests. One anonymous visitor warned us about this spirit that lived in the woodwork next to the refrigerator. The spirit has a good view of the spot in front of the fireplace where we enjoyed several romantic evenings. On our first full day in Big Bear, we went hiking and canoeing. While paddling around on the lake, we rescued this wayward rubber ducky. It says 'READING IS A BLAST' in red letters on his chest. Snorkelduck is our fondest souvenir of the trip. 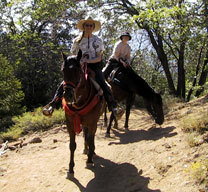 On the second full day, we went on the sunset trail ride. We liked it so much we went back for a longer ride the day after. I had never really ridden before, and I enjoyed it immensely. We spent several hours at the Pine Knot Coffee House drinking cafe au lait and playing games. 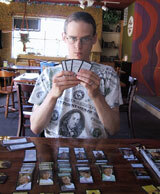 In this picture, I'm pondering my move in a game of Caesar and Cleopatra -- I always get to play Caesar. Our last night in Big Bear, we ate at Boo Bear's Den. They had mediocre chicken-fried steak, a generous serving of local flavour, and Wednesday Night Karaoke. Cristyn sang Scarborough Fair , and I belted out Hotel California .